People say we're spoiled. With sunshine. Yes, we people here at Southern California enjoy sunshine a little too much, and most of us are actually okay celebrating Fall with tanks and shorts. But whether you're a bride, a guest, or just out and about on a normal day, make SPF your best friend! A quick Google search will let you how much damage the UV rays can do to your skin. We always recommend our brides to use SPF, and there are some tried-and-true sunscreens that we love to use with makeup (because, well, sunscreen and makeup and photography don't always play nice together..). One of the best we've used is Shiseido Anessa Sunscreen. The consistency is more liquid and watery than a lot of sunscreens, and we love it because it feels lighter and not greasy. Most people underestimate the proper/effective amount of sunscreen to use, and the watery consistency makes it so much easier to layer and "slather it on". Wedding season is in full bloom! As much as we all love having the sunny breeze, many brides worry that being a spring/summer/early fall bride means having to compromise. Crying (and sometimes nervous sweats) is inevitable, but one of the most common requests we get from brides is "foundation that looks flawless even after the crying and sweating". And while prepping your skin before the big day is important, (and having the right makeup artist being equally important :p), we have our tried-and-true foundation that we love to use on brides -- Giorgio Armani Luminous Silk Foundation. The Armani Luminous Silk Foundation lives up to its name--it goes on silky smooth! It melts into your skin giving your skin a radiant, smooth, yet believable glow. We love using Airbrush for brides, and this foundation is just magical when airbrushed. It's weightless, yet pigmented that we can customize the coverage. Even with full coverage, it's still breathable (and when applied with airbrush, you wouldn't even feel like there's full coverage foundation on your face). Feather-light and breathable coverage means it'll withstand tears and sweat, making your bridal look long lasting and still flawless until you're ready to take it off! While we all wish we can go to sleep and wake up with bright eyes and perfectly tousled hair, proper “make-off” is important for maintaining skin and hair health. We only use products that are tried and true and safe for most skin types. But however good a makeup product is, it is still only supposed to stay on your skin temporarily. Here are some tips to keeping your skin looking beautiful, and break-out free. 1. Even if you don’t normally wear makeup, plan ahead and have makeup removers ready. It’s best to have a makeup remover for the face, and have a separate “Waterproof Makeup Remover” for your eye & lip makeup. Or you can opt for the convenient “Makeup Remover Wipes”. Just make sure they’re formulated for waterproof makeup, and remember to wash your face with cleanser after taking off makeup. 2. What about the false lashes? Do I yank them off? No! Never just yank off the false lashes. Soak a cotton pad/ball (no cotton? Kleenex will do) with eye makeup remover and leave on the lids and lashes for ~20 seconds. The lash glue will soften, and this is when you can gently pull off the lashes, without losing all your real lashes. 3. Making sure your face is clean. If you can see traces of foundation on your face after your attempt to make-off, your face is not clean. If you’re not sure, you can soak a cotton pad with toner and gently wipe your face. If you see any color, better wash again. There are many cleaning devices on the market now that will help you make sure your face is clean. Some are quite the investment, but in our minds, an investment is better than dealing with break-outs. Makeup removers and face wash are meant to clean, but they can strip away the natural oils our skin needs. Moisturize with your daily skincare routine to restore the balance, or do a hydrating mask to reward your skin after a long day. Healthy skin should feel supple and a little cool to the touch. In case you didn’t know, dryness can also cause break-outs and sensitive skin. 5. Wash your hair with conditioner first. It’s a good idea to wash your hair when you’ve had it styled. Hairstyling products can easily clog pores, making your scalp sensitive and making you break out. Some products can also transfer onto your pillowcase, making you sleep on a bed of hairspray and wax and gel without even knowing it. If it’s hard to brush out the hairdo, rinse with warm water first, and soak your hair with conditioner (avoiding the scalp) for about 3 minutes. Warm water and conditioner will soften the strongest hold hairspray. Gently brush out your hair with wide-tooth comb and proceed to wash with shampoo. We hope these tips will make you look and feel beautiful, even days after you take off the makeup we so proudly did on you! Finding the right concealer can be frustrating. There are so many trouble areas on the face that need some "help". It could be the zits on your chin, the sun spots on your cheeks or the terrible under eye circles that would not go away. How can you find something that works for all? As makeup artists, we have probably ten different kinds of concealers in our bag. None of them are perfect. A perfect concealer in our heart should have 1) great coverage, 2) wide color range, 3) fast drying formula, 4) long staying power and 5) easy-to-blend consistency. ..until our encounter with the Magic Wand: the NARS Radiant Creamy Concealer !! It has became THE favorite must-have in our kits and our clients love it! Custard and honey are the two most popular colors and are usually sold out in Sephora. Grab yours soon and share with us your feedback ! 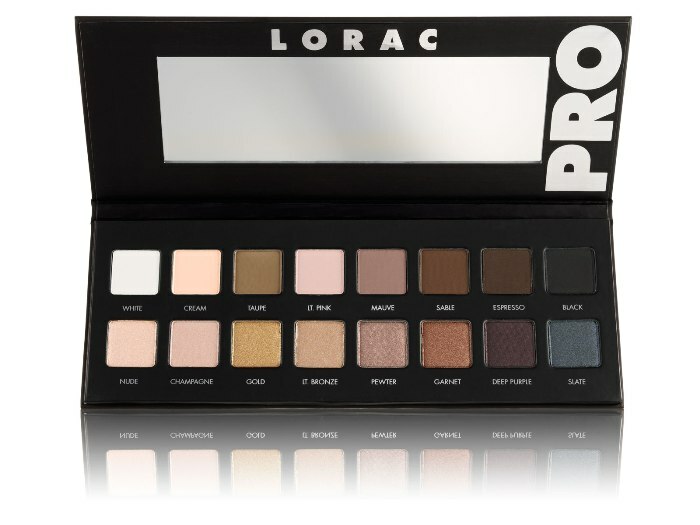 Be like a Pro: Lorac Pro palette ! People always ask me: What is the one thing in your kit you absolutely love and need. As a makeup junkie and a liberal lover to all cosmetic products, I have a clear answer for that: The Lorac Pro palette! Before I met this baby, I had numerous neutral eye shadow palettes. Either I bought it pre-made or I self-assembled. With the many that I had, I was still in the hunt of the "Holy Grail" palette until I met Lorac Pro Palette !! This palette is simply amazing. It consists of sixteen eyeshadows, (half are shimmery, half are matte). You have your basic light to dark matte color, and it comes with warm and cool tone neutrals. The eyeshadows are ultra-pigmented and can be applied wet or dry. The package is super slick and light weight. Even though it is made with cardboard (I think), I found it very durable. If I can only keep one eyeshadow palette in my kit, this would be it! The first step in becoming a pro -- try this Lorac Pro Palette!